Graecia capta ferum victorem cepit (once Greece had been captured, it captured its wild conqueror - Horace Ep. 2.1) this sentence summarizes the influence of Greece on its Roman conquerors. In 196 BC the Roman legions defeated the Macedonian King Philip V at Cynoscephalae and Greece fell into the Roman sphere of influence. During the Republican period the consuls and the Senate were not prepared to grant any favours to the Greeks who tried to resist the Roman rule. In 146 BC and in 86 BC the rebellions of Corinth and Athens were cruelly punished. Later on however the approach changed: Julius Caesar and Augustus were fascinated by the Hellenistic way of life and after them many emperors had a predilection for Greece; Nero extensively travelled in Greece and granted a large tax exemption to the country. Athens was favoured by the emperors and Emperor Hadrian enlarged the city. 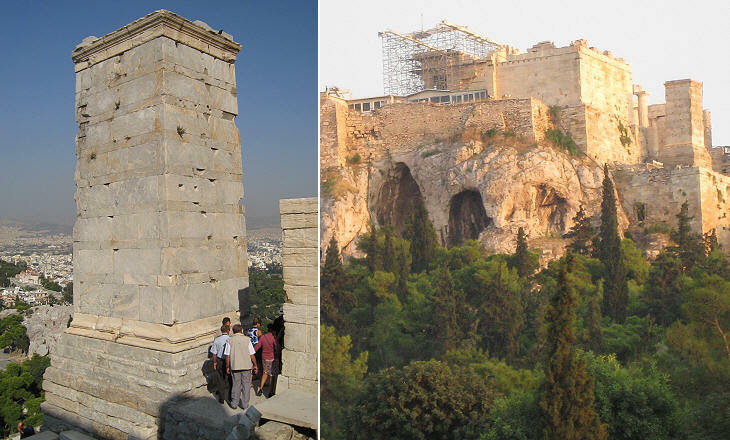 Several monuments were built during the Roman rule, mainly to the north and the east of the Acropolis, an area which today is crossed by a street dedicated to the emperor (Odos Adrianou). At the initiative of Julius Caesar a new market was built in a spacious rectangular courtyard surrounded by stoas (roofed arcades), shops and storerooms. 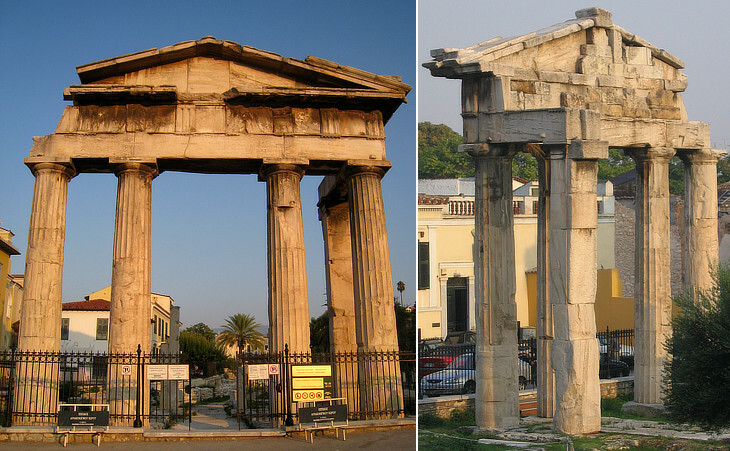 It had an east Ionic entrance and a west Doric entrance, known as the Gate of Athena Archegetis, the patroness of Athens. It was completed between 19 and 11 BC with donations from Emperor Augustus. During the reign of Hadrian the court was paved with slabs. 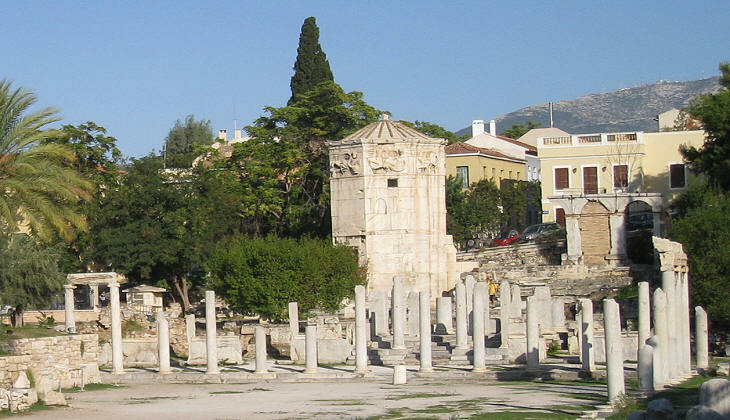 After the invasion of the Heruli in 267 AD the administrative and commercial centre of the city was transferred from the Ancient Agora to the Roman Agora. During the Byzantine and Ottoman periods houses, workshops and churches along with a mosque were built in this area. The market was not limited to large imposing buildings, there were also some other aspects which needed to be addressed. Public toilets were housed in a rectangular building and consisted of an antechamber and a square hall with benches bearing holes (still visible) on all its four sides. They were constantly flushed and the water was collected by a sewage pipe underneath. These dated back to the 1st century AD. Ignorantia legis non excusat (ignorance of the law excuses no one) was a key principle of Roman Law. As a logical consequence care was taken to make laws known as much as possible; those regulating the various kinds of trade were written on upright slabs which were placed at key points of the market. 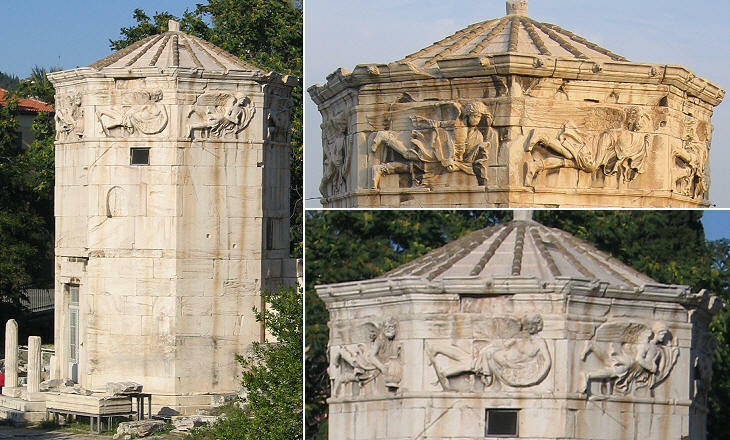 This octagonal tower inside the Roman Agora is called Tower of the Winds after the eight reliefs representing a wind, symbolized by a male figure with its name engraved on the stone. There were sundials on the external walls and an elaborate water clock in the interior. The tower was built in the first half of the 1st century BC by the astronomer Andronicos. In the early Christian period it was converted into a church or a baptistery of an adjacent church, and in the 18th century it was attached to a tekke, a monastery of the Dervishes. 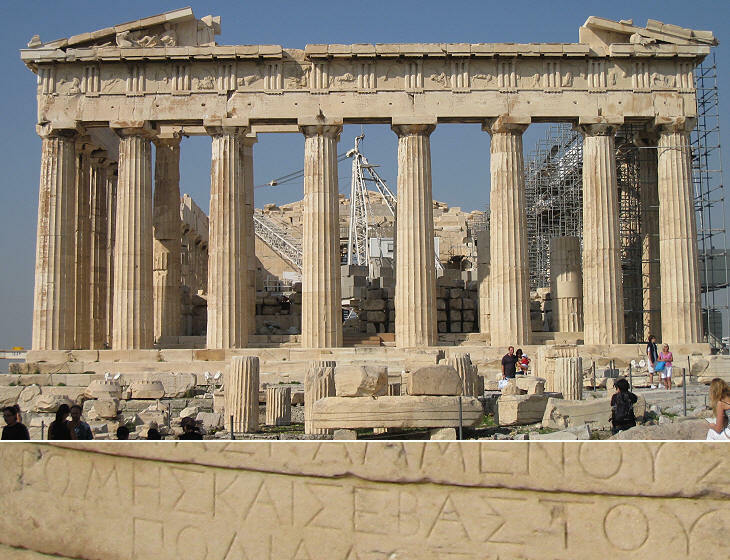 Visitors to the Acropolis of Athens focus their attention on the key monuments of the Classical period and chiefly on the Parthenon and the Erechteion; they may fail to notice a Temple to Rome and Augustus near the eastern front of the Parthenon (also because guidebooks and indications on the site are silent on remains of monuments of later periods). Temples to Rome and Augustus were built in many cities of the Empire; that at Ankara is famous for its long inscriptions; the temple on the Acropolis of Athens was circular and it was decorated with Ionic columns; it had a white marble entablature with a dedicatory inscription; in Latin augustus was an adjective meaning "inspiring respect and admiration"; in Greek it was translated with sebastos. Marcus Vipsanius Agrippa was a Roman general who defeated Antony at the 31 BC Battle of Actium; he was a friend of Octavian/Augustus and became his lieutenant; he was appointed governor of the eastern provinces of the Empire, a task which he preferred to perform from Greece. Agrippa promoted the construction of several buildings in Rome and in particular of the Pantheon. In Athens he built a large odeon in the ancient agora: the building had a grand entrance the entablature of which was supported by telamons portraying giants and tritons. The building was damaged by the collapse of the roof in 150 AD and it was destroyed in 267 by the Heruli. 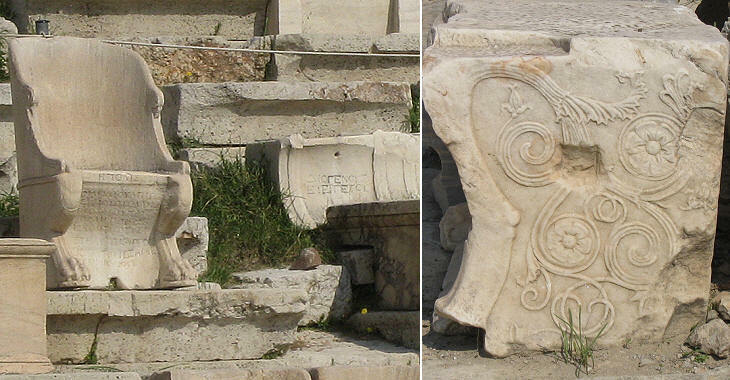 The image used as background for this page shows a capital of Agrippa's Odeon. A statue of Agrippa was placed on a high pedestal at the entrance to the Acropolis in recognition of his patronage; it was an indication of the popularity enjoyed by Agrippa, who was seen as the possible successor to the emperor, who did not have male heirs. Augustus, following the advice of Maecenas, one of his closest advisors, convinced Agrippa to marry his daughter Julia in order to strengthen his loyalty; this occurred in 21 BC. 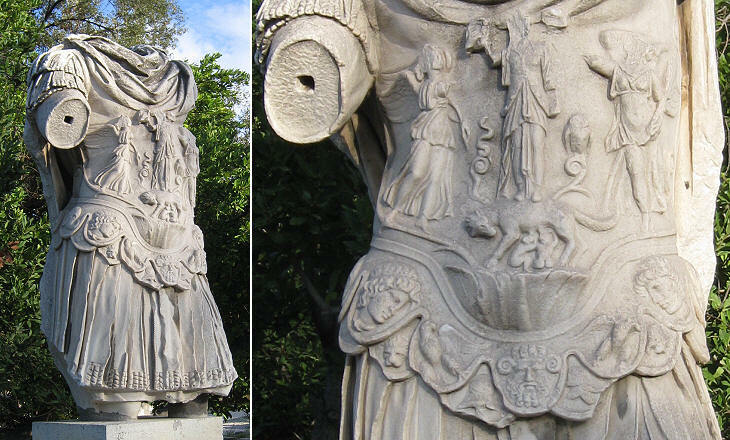 The pedestal was originally built to support a statue of Eumenes II, King of Pergamum, a key ally of the Romans in their conquest of Greece: it is slightly tapered and it is made of grey-blue Hymetus marble. 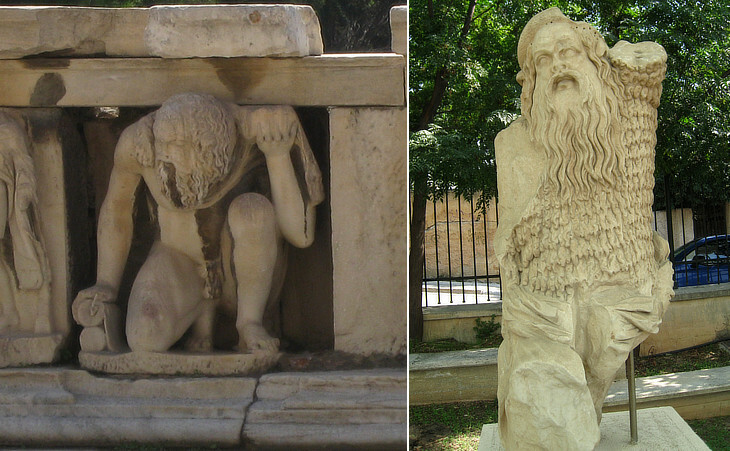 The major open-air theatre of Athens was located at the foot of the Acropolis; it was dedicated to Dionysus, the patron god of theatre; the ancient building fell into disuse until Emperor Nero promoted its reconstruction; the decoration was mainly based on statues and reliefs portraying Silenus, a companion to Dionysus; he was portrayed as a bald and fat aged man; Silenus was usually drunk and because of this he had the power of prophecy. 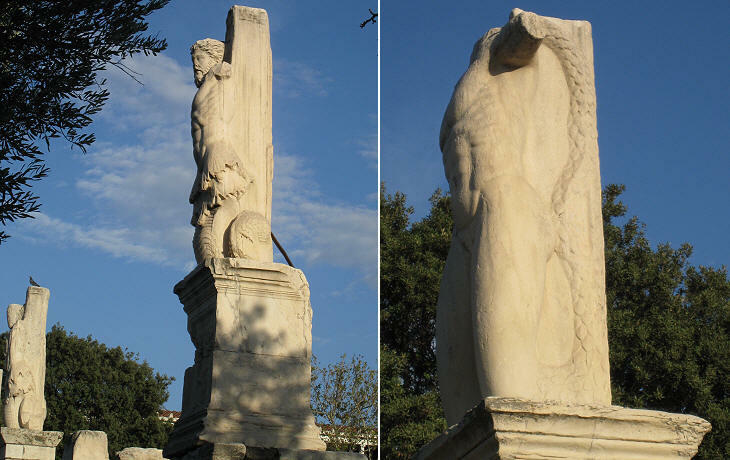 The monument to Philopappus is dated to 114-116 AD. It was erected on the hill of the Muses (opposite the Acropolis) by the Athenians in honor of a great benefactor of their city, the exiled prince of Commagene, Caius Julius Antiochus "Philopappus" (= Grandfather-Loving) who settled in Athens, became a citizen and assumed civic and religious offices (he was both consul in Rome and archon in Athens). Commagene was a buffer state between the Roman and the Parthian empires. It was located in south eastern Turkey and today it is remembered for the colossal statues which one of its kings erected on the top of Nemrut Dagi, a high mountain in the district of Katha. In 72 AD Emperor Vespasian incorporated the kingdom of Commagene into the Roman province of Syria and the heirs of the last king were offered a golden exile and public offices in Rome. The north side of the monument, which is clearly visible from the Acropolis, is decorated with statues of Philopappus and of the last kings of Commagene. The relief shows Philopappus on a biga (chariot), acting as a Roman consul. 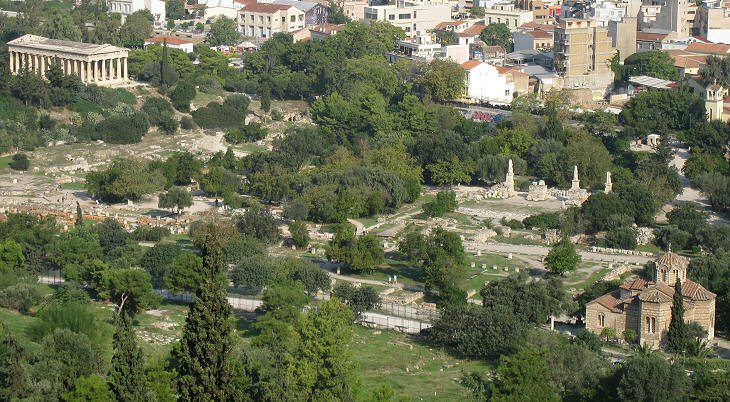 In 1687 the Venetian artillery hit the Parthenon from this hill (see a page on this episode).